The MV Quinsam is an automobile ferry operated by BC Ferries. It was built in 1982 by Vancouver Shipyards in Vancouver, British Columbia. The ferry was originally part of the Ministry of Transportation and Highways' (MoT) saltwater ferry fleet until 1985, when the MoT's saltwater ferries—including Quinsam—were transferred to BC Ferries. 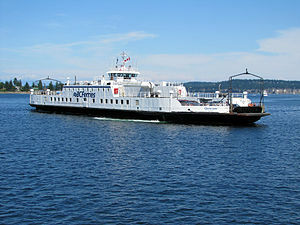 Quinsam carries 70 cars and replaced the smaller MV Quinitsa (which carries fifty cars) on the Nanaimo ↔ Gabriola Island route. This is the first and only route that Quinsam has served throughout her career. Quinsam has few passenger amenities on board. On each side of the car deck, there are small passenger lounges where there is some seating, as well as washrooms and vending machines. In 2010, she underwent a $16 million mid-life upgrade where she received new engines and generators, a rebuilt pilothouse and passenger cabin, as well as steel replacement. ^ a b c d Hammersmark, John. "Quinsam - BC Ferries". Westcoastferries.ca. Retrieved 12 June 2013. ^ "What is Onboard: Quinsam". BC Ferries. British Columbia Ferry Services Inc. Retrieved 12 June 2013. ^ "MV QUINSAM RETURNS TO SERVICE AFTER $16 MILLION UPGRADE" (PDF) (Press release). Victoria, British Columbia: British Columbia Ferry Services Inc. 17 May 2010. Retrieved 2013-06-12. This page was last edited on 26 March 2019, at 16:42 (UTC).